In Illinois, Domestic battery cases are vigorously prosecuted. If convicted, you will face serious penalties including losing any right to possess a firearm, high fines and possible jail time. Additionally, Illinois has adopted a no drop policy which allows the State’s Attorney’s Office to continue prosecuting you even if the complaining witness recants their story or wishes to drop the charges. I understand that just because you are charged with domestic battery, does not mean you are guilty of any wrongdoing. Many times, a story may be blown out of proportion and as a result you may be improperly charged. The domestic battery laws in Illinois strongly favor the alleged victim and arrests are often made with little to no evidence. Some cases are brought by one partner who is trying to obtain an advantage in a divorce or custody case. Other times, the complaining witness may make false statements to the police in order to lash out against their partner. Police Officers are trained to make an arrest when they suspect a domestic battery has occurred. Arrest decisions can be made based on false accusations that have no basis in reality. When you are found in this situation, you will need an experienced lawyer to help you fight these accusations. Charged with a crime? Schedule an appointment to meet with one of our experienced Criminal Defense Attorneys. If you were attacked and forced to defend yourself, then its possible that self defense may apply. Self defense is an affirmative defense that will excuse the criminal conduct. Essentially an affirmative defense is like saying, “I did it, but I had a good reason to do it.” In order to prove self-defense, the defendant needs to show that they were under an immediate threat of harm and committing the battery was the only to extricate themselves from that potentially harmful situation. In order to claim self-defense, the defense will need to file a notice of affirmative defense with the court in order to put the prosecution on notice that this defense will be used at trial. Once self-defense is filed, the defendant should also file a motion for disclosure to the defense asking the prosecution to turn over any violent criminal history of the alleged victim they are aware of. Courts have ruled when a defendant claims self-defense, any prior incidents of violent behavior committed by the alleged victim can potentially be admissible at trial. This includes convictions for any violent crimes and any incidents of violent behavior, even if they were not charged or reported to the police. To admit previous violent behavior of an alleged victim, the defense will need a certified copy of the conviction from the circuit clerk’s office where the conviction occurred. In the case of a violent incident that was not charge, the defense will need to call a witness to testify about the violent incident. If the defense wishes to admit evidence of any prior incidents that show the alleged victim has a propensity for violence, then they will likely have to file a motion in limine outlining exactly what they are seeking to admit at trial. The judge will hear the motion prior to trial and decide on whether the jury will be allowed to hear the evidence. In addition to bond conditions that are set on persons charged with Domestic Battery, it is possible for the alleged victim in the case to seek an order of protection. Orders of protection are court orders that are designed to protect one family or household member from the actions another. They are governed by the Illinois Domestic Violence Act. An Order of Protection is a civil order and not criminal in nature. However, if the order of protection is granted and the respondent violates the terms of the order, then the State may file criminal charges. These charges would be for violation of an order of protection and would be in addition to any domestic battery charge that the state has previously filed. Stop harassing, abusing, stalking, and intimidating a protected party. Stop interfering with a protected party’s personal liberty. Require a Respondent to stay away from your shared home while under the influence of drugs or alcohol. Require a Respondent to attend counselling. Require a Respondent to stay away from a protected party’s home, work, school or any other place specified by the order. Not have any contact with the protected party including, text messages, social media, and phone calls. Must surrender FOID card and surrender any firearms owned during the term of the order of protection. Prohibit the Respondent from taking a child out of state. Limit or restrict custody of children. Custody arrangements are subject to visitation as defined in the order of protection. Custody of any household pets. Respondent may be required to turn over certain personal property and may further be ordered to refrain from damaging other personal property or property that is co-owned with the Petitioner. The Respondent may be ordered to pay child support, child counselling, and any losses the Petitioner may have suffered as a result of the Respondent’s actions. Any other condition that the Court considers reasonable for the protection of the Petitioner. To get an Order of Protection, a person must file a Petition with the Circuit Court asking that an order be entered against a family or household member to limit or restrict certain types of contact and activities. Usually the Clerk of the Circuit Court will have a dedicated window exclusively for servicing orders of protections. This window is usually staffed with personnel specially trained handling these types of cases. When filing a petition for an order of protection, the petitioner must list all the reasons they are seeking an order of protection. 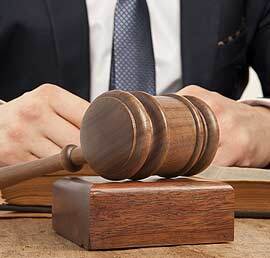 Once the petition is filed, the petitioner will in short order have a hearing in front of a Judge. In this initial hearing, the petitioner will be sworn in, the Judge will read the petition and may ask additional questions of the petitioner. This is usually a very brief hearing and the only evidence that is taken will be the word of the Petitioner as contained in the petition and as testified to in front of the Judge. The offending party listed in the petition will not be present and they will not be able to challenge the credibility of the allegations in the petition. The Judge will simply consider that if all the allegations are true, would an order of protection be warranted. That the Petitioner (or a protected party on whose behalf the petition has been filed) is a “family or household member” of the Respondent. That the court has jurisdiction to hear the case. The term abuse is defined within the Illinois Domestic Violence Act as physical abuse, harassment, intimidation of a dependent, interference with personal liberty or willful deprivation but does not include reasonable direction of a minor child by a parent. If the Petitioner has alleged the three elements above in their petition, the Judge will grant an Emergency Order of Protection and then set the case out for a hearing on a plenary (or more permanent order of protection). An Emergency Order of Protection is also referred to as an ex-parte order of protection, because it is heard without the respondent present to challenge the sufficiency of the allegations contained in the petition. Once the emergency order of protection is granted by the Judge, the next step will be to serve a copy of the order on the Respondent. An Emergency order of protection is not effective until it is served on the Respondent and this service is usually conducted by the Sheriff’s Department. Once the Respondent is given notice of the order, they are subject to all the conditions that are contained in the order. These conditions usually include not having any contact with the petitioner or protected party as listed by the Petitioner, stay away from the protected party’s residence or place of work, and in certain circumstances, the court may even determine distribution of property, child support and child custody in an order of protection where the parties are married or have a child in common. Additionally, anyone who is subject to an order of protection will have to surrender their FOID card and will not be able to possess a firearm while the order of protection is active. A Plenary Order of Protection is a more permanent order of protection and usually lasts 2 years but can be modified by agreement of the parties. Before the court can issue a Plenary Order of Protection, the Respondent must be given an opportunity to respond to the allegations in the petition. Once the Respondent is served with the petition and the emergency order of protection, they will have an opportunity to prepare a defense to the allegations. Since an order of protection is civil in nature, the civil rules of evidence and discovery control the order of protection hearing. This allows the respondent to ask the petitioner for any medical records that may have been related to any allegation in the petition, serve the petitioner with interrogatories, and file a response to the allegations. testimony from the parties usually offering their recollection of the alleged events. There is no right to a jury during an order of protection hearing and a Judge will be the trier of fact. The Judge will be charged with deciding whether the events alleged by the petitioner are true and if they are true, would those allegations warrant an order of protection. The only thing the allegations have to show is that the petitioner is a household member that has been abused within the jurisdiction. Once a Judge grants the Petitioner’s Order of Protection, that order will contain several things the Respondent will be prevented from doing and in some cases, some things that the Respondent will be required to do. If a Respondent does any of the prohibited activities, it will be possible for the Respondent to be charged with a violation of an order of protection. These activities usually include contact with the alleged victim or any other protected party, contact with a protected party’s home address or place of employment, or using a third party to facilitate contact with a protected party. If the parties in an order of protection are married or have children together, it is possible for the order of protection to address possession of assets, child support, and child visitation. For a married couple with children, an order of protection will serve as a mini-divorce and there will be a resolution for a lot of items that are usually settled in a divorce case. These orders for child support, visitation, and distribution of assets will last as long as the order of protection is effective or it is superseded by an order for a dissolution of marriage. While an Order of Protection is civil in nature, violation of an order of protection can lead to criminal charges. When the petitioner feels that an order of protection is violated, they will contact the police and report the violating behavior. The police will then be able to look at the order issued by the judge and they will make a field determination whether they think the order has been violated. If the police feel the order has been violated, which can be a very low bar such as the respondent sending a text message, then the police will either arrest the offending party if they are present, or they will seek an arrest warrant from a judge for the offending party. A first offense violation of an order of protection is usually charged as a Class A misdemeanor, which can involve up to a year in jail, fine of up to $2,500 plus any costs, and probation or conditional discharge for up to 2 years. A Class 4 Felony Violation of an Order of Protection has a possible sentence of 1 to 3 years in the Department of Corrections. The court shall impose a minimum penalty of 24 hours imprisonment for defendant’s second or subsequent violation of any order of protection; unless the court explicitly finds that an increased penalty or such period of imprisonment would be manifestly unjust. As an Illinois Criminal Defense Attorney, I have consulted with hundreds of individuals who are facing domestic battery charges. The question that is asked most often is whether the alleged victim in the case can simply drop the charges. The short answer is no. In Illinois, domestic battery charges are prosecuted by the State’s Attorney’s Office and not the alleged victim. Additionally, most jurisdictions have adopted a “no drop” policy when it comes to domestic battery cases. This means the State will continue prosecuting the case despite the wishes, or even the cooperation, of the alleged victim. A person who, with intent to deter any party or witness from testifying freely, fully and truthfully to any matter pending in any court, forcibly detains such party or witness, or communicates, directly or indirectly, to such party or witness any knowingly false information or a threat of injury or damage to the property or person of any individual or offers or delivers or threatens to withhold money or another thing of value to any individual commits a Class 3 felony. Moreover, If the State suspects that the Defendant coerced the alleged victim into not testifying against them, the prosecution may be able to admit the alleged victim’s previous statements into evidence, even if they are not available to testify at trial. This is done under the theory for forfeiture by wrongdoing. Basically, if the court rules the Defendant had a hand in making the alleged victim unavailable for trial, not only does all of the alleged victim’s statements come into evidence but the defense forfeits their right to cross examination. Having the alleged victim’s statements admitted into evidence without the ability to cross-examine them can severely hinder the defense’s case at trial. Additionally, defendants in domestic battery cases are usually prohibited from contact with the alleged victim through bond conditions assigned by the court. This includes, speaking with the alleged victim, phone calls, text messages, social media, and sending messages through third parties. Should the defendant violate these bond conditions they would be subject to a revocation of their bond, which would require them to stay in custody pending the resolution of their case, and possible new criminal charges for a violation of bond conditions. Can the alleged victim simply change their story? If an alleged victim decides to change their story prior to trial, this will not prevent the State from continuing to prosecute the case. Should the alleged victim take the stand and give testimony that is significantly different than what they reported to the police, then the State may attempt to impeach them based on their prior statements, statements of third party witnesses, physical evidence such as photographs of injuries or ripped clothing, 911 calls, etc. This may seem unusual that the prosecution would be impeaching their own witness, but it is common practice in domestic battery cases. Moreover, if a Defendant is caught trying to persuade a witness to testify in a manner that supports the Defendant’s theory of the case, they could be charged with suborning perjury, a class 4 felony. Telling an alleged victim to make a statement that “nothing happened” will be interpreted by prosecutors and judges as criminal behavior and will likely result in new felony charges against the Defendant. Additionally, if the Defendant is caught trying to coerce a witness, it will have a severely negative impact on the pending domestic battery case in that the prosecutor will be less likely to negotiate a favorable disposition and even if the witness does change their story, their original statements will still be admissible at trial. This is especially a concern for defendants who are in custody trying to contact alleged victims using the jail’s phone systems, as all of these calls are recorded and monitored by the jail staff. When a person charged with Domestic Battery and is held in custody, all their communications, except communications with their legal counsel, are subject to monitoring. If the inmate attempts to contact the alleged victim in their case, the jail will send a copy of that communication to the State’s Attorney’s office. Once the State’s Attorney’s Office receives the communication, they will determine whether to file additional charges. With more and more technology being made available to inmates, such as laptops and ipads, this expands the means with which an inmate may attempt to contact a witness in their case and try to persuade them to change their story. All of these avenues of communication with the outside world are being monitored by the jail staff. If an inmate attempts to use an ipad or another inmate to communicate with the alleged victim in their case, they will likely have more charges filed against them. Often times, alleged victims are weary of making any statements that are inconsistent with the original statement they made to the police. This is because most State’s Attorneys Offices employ victim witness coordinators to assist in the prosecution of domestic battery cases. The primary job for a victim witness coordinator is to ensure that the victim will be available to testify and do so in a manner that is favorable to the prosecution. Most of the time, alleged victims are reminded about the penalties for filing a false police report and for perjuring themselves on the stand. These reminders serve to ensure an alleged victim’s attendance at trial and that their testimony will be consistent with their previous statements to law enforcement. Because of this, the alleged victim is often fearful of the possibility of criminal prosecution if they change their story. Victim witness coordinators also work closely with social service agencies like DCFS and may even threaten alleged victims with the prospect of losing custody of their children if they do not assist the state with the prosecution of the suspected abuser.